We take ABM principles to the top of the funnel. Drip campaigns are used to build awareness but they require you to find the right person, at the right company, at the right time. Leads are added to your list and you keep sending your message, over and over, until your contact is ready to reach out or they just opt-out. We approach campaigns and content differently because sharing multiple pieces of content simultaneously can tell your story BETTER and ultimately amplify campaign results. Content can be viewed on line, saved to the library and shared across targeted companies with ease. 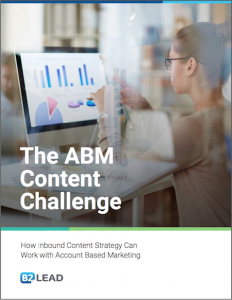 This informative white paper by Gregg Medaglia, CEO at B2Lead, explores leveraging your existing inbound content for effective, targeted ABM campaigns that scale. Account Based Marketing (ABM) continues to gain popularity as B2B marketers embrace this marketing approach in growing numbers. Clearly, there are major benefits to ABM implementation. ABM techniques, as you’ve probably discovered, offer inherent hurdles in content development and distribution. Unlike standard content marketing—where the main goal is to create content that attracts the attention of a large audience—ABM content is tailored to meet the needs and interests of the specific accounts identified as being your ideal “best-fit” customers. Such personalized content requires intense research on targeted accounts and can be difficult to scale. Implementing ABM as an “AND” inbound not an “OR” inbound exercise.